Four decades later, Beijing police ask nanotech engineer Wang Miao to infiltrate a secretive cabal of scientists after a spate of inexplicable suicides. Wang's investigation will lead him to a mysterious online game and immerse him in a virtual world ruled by the intractable and unpredictable interaction of its three suns. This is the Three-Body Problem and it is the key to everything: the key to the scientists' deaths, the key to a conspiracy that spans light-years and the key to the extinction-level threat humanity now faces. 'Wildly imaginative, really interesting ... The scope of it was immense' Barack Obama, 44th President of the United States. 'A marvellous melange of awe-inspiring scientific concepts, clever plotting and quirky yet plausible characters, all conveyed in in a plain style capable of signalling hidden depths' The Times. 'The best kind of science fiction' Kim Stanley Robinson. 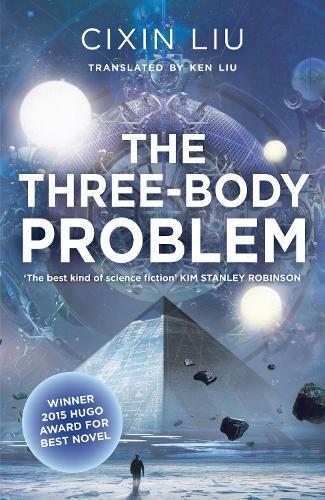 'Liu Cixin's impressive The Three Body Problem won the 2015 Hugo award for best novel, the first time a Chinese writer has taken that prize' Guardian (2015 Books of the Year). 'It's a stunning, high-concept, rollercoaster of a novel which offers an intriguing Eastern perspective ... this is a trilogy which, like Asimov's Foundation epic, looks set to quickly become an essential science fiction classic' Starburst Magazine (rating: 9/10). 'China has a lively SF scene inaccessible to western audiences until recently, so it's a great pleasure to read this book by Cixin Liu - the country's most popular SF writer - in English. Handled expertly on the terms of the genre, it is seeing this tale played out through a different cultural lens that makes the book fascinating. The translation is exemplary. The book is top-flight SF; smart, informative and engaging' SFX. 'Hard science fiction at its finest, and fans will appreciate the superb attention to detail that drives this constantly evolving and impressive series' SciFiNow Magazine. 'The writing is superb ... The ideas are astounding, real eye-openers that expand the mind and really get the old grey matter going ... A stand-out, award-worthy novel and one that deserves a place amongst the science fiction classics' SF Book Reviews. 'For a book that makes you think, and holds true to some of the traditional values of SF, this one can't be beat' SFF World Magazine. '[The Three-Body Problem and The Dark Forest are] the works of fiction I am most enthusiastic about' Bloomberg. 'A breakthrough book ... a unique blend of scientific and philosophical speculation, politics and history, conspiracy theory and cosmology, where kings and emperors from both western and Chinese history mingle in a dreamlike game world, while cops and physicists deal with global conspiracies, murders, and alien invasions in the real world' George R.R. Martin. SF iBook of the Year - Apple UK. 'A celebration of science as saviour' The Hindu. 'This book lives and dies by the quality of its ideas. Fortunately, the many, many different questions posed are fascinating and imaginative and I barreled through this novel right up to its gripping conclusion' Bending Over Bookwards. 'A book rich in ideas, puzzles and theories but each of them is explained in a way that isn't only accessible but is also absolutely engrossing ... The ideas are vast but they are beautifully expressed and, for this, credit must also go to Ken Liu who has done a fantastic job of translating this masterpiece. I loved where The Three Body-Problem took me - it is tense, wondrous and fascinating and I am so ready to read its successor, The Dark Forest, the next in this exciting, original and gobsmacking trilogy' For Winter Nights. 'A really fascinating book and I'm delighted that there are two more to come in the series ... I'd recommend to readers who want to enjoy the science as much as the story' SFcrowsnest. 'A book that you must have read, whether you are a Science Fiction fan or not. Cixin Liu tackles so many different topics from action, thriller and a strong emotional backdrop ... I cannot imagine what effort it must have cost to translate such an epic story to English but it paid off really well. A great performance' The Book Plank. Liam Nicholson at Sheffield Orchard Sq. Having not picked up a book for a while , I was intrigued by the science and mystery surrounding this title. Three-Body- Problem sounds like a mathematical challenge of some sort, and its not far off.